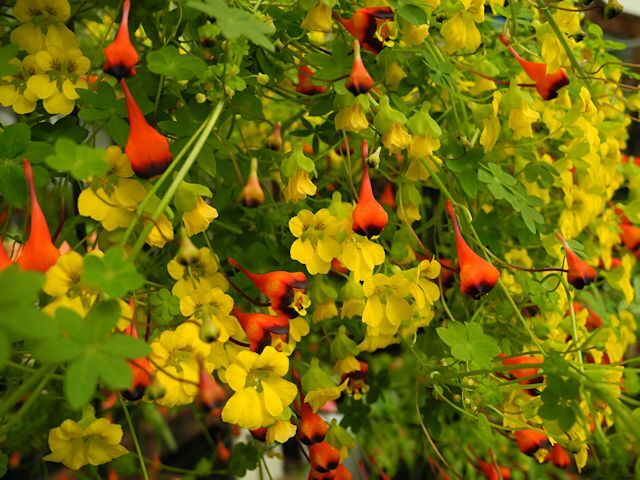 Tropaeolum is a genus of about 80 species native to South America in the Tropaeolaceae family. 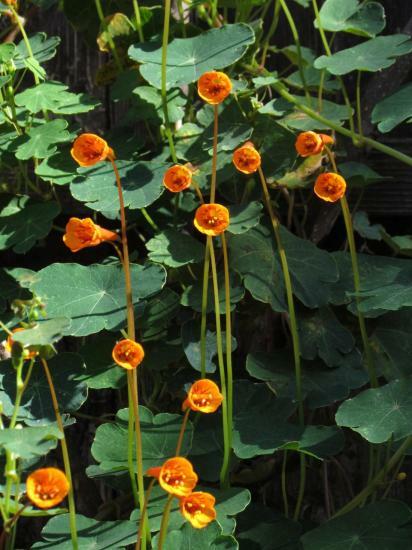 The common nasturtium (Tropaeolum majus) is the most easily encountered member of this family. Some of the species have tuberous or rhizomatous rootstocks. 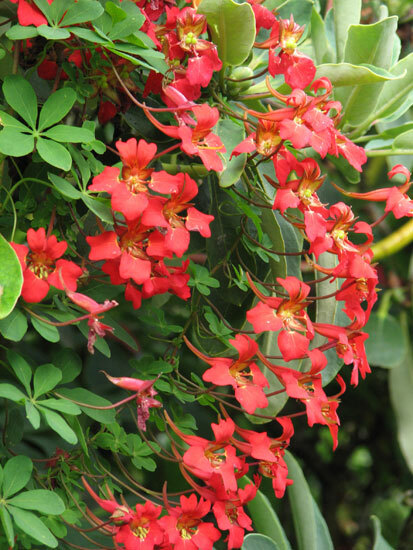 The bright flowers of quaint shapes are usually freely produced on long stalks and the rapid growth of many of the climbers renders the Tropaeolum a very useful and decorative plant for many purposes. 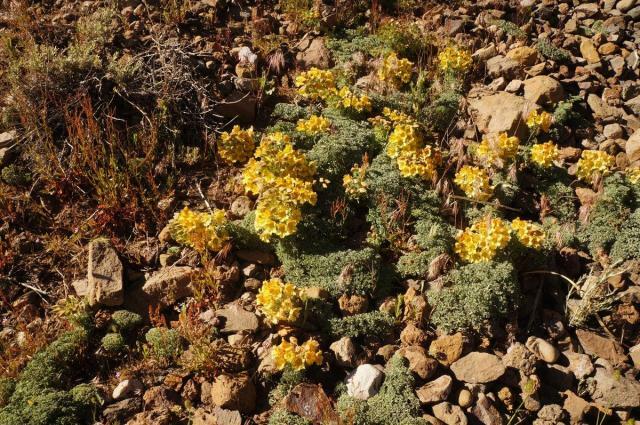 Species from the coastal areas and many from the lowland foothill areas of the Andes are winter growers and those that are true alpine are summer growers. 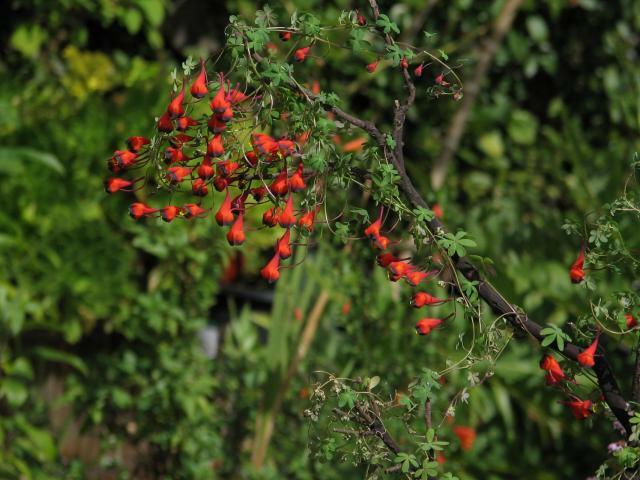 Growing Tropaeolum from seed is one of the best way to propagate them because of the slow vegetative division of the rootstock in some species. 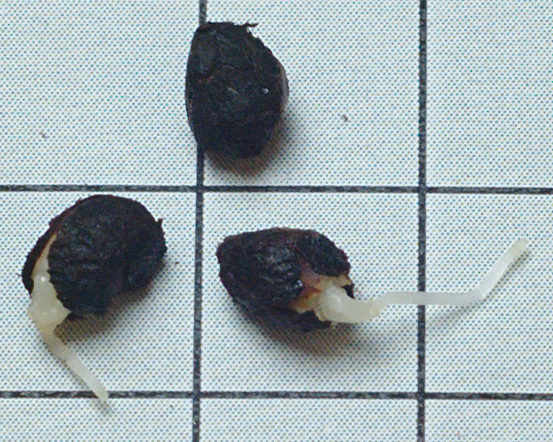 Seeds should be sown as fresh as possible according to many growers (Christian Terry and Diana Chapman) but Jane McGary was able to get good germination on seeds that had been dried for 7 months. 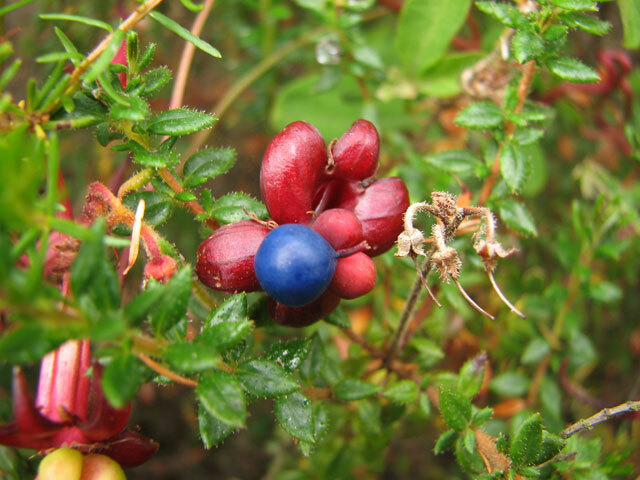 Seeds of winter growing species such as T. hookerianum, T. azureum, T. tricolor and T. brachyceras are coastal and should be sown in the fall. 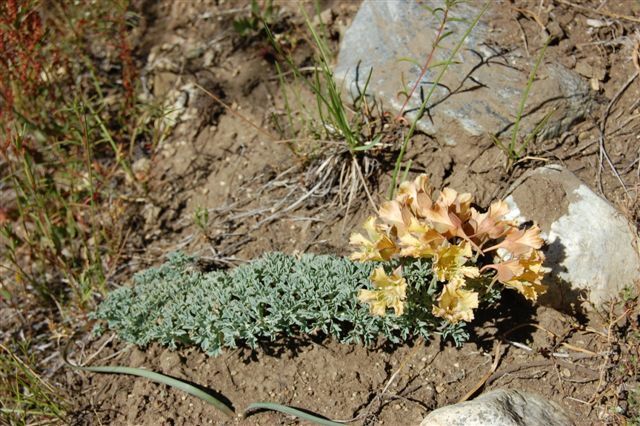 Alpine species such as T. nubigenum, T. polyphyllum and T. sessilifolium should be sown in the spring. Sow the seeds in a well-draining mix and cover with 1-2 cm (1/2 - 3/4 inch) of sand. Keep the pots about 4-0 °C (40-32 °F) but not below freezing nor too warm because germination can be inhibited at higher temperatures. Seeds should germinate in about 1 month. 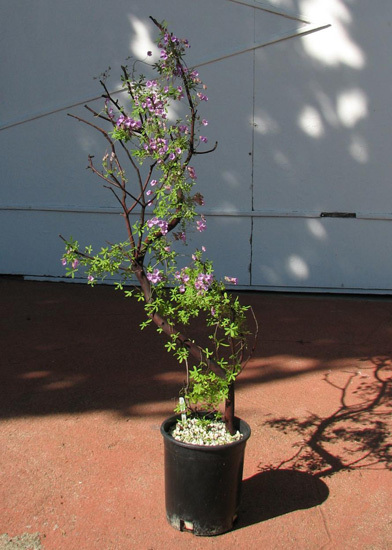 This treatment works very well for T. tricolor, T. brachyceras, T. azureum, T. rhomboideum, T. hookerianum ssp. 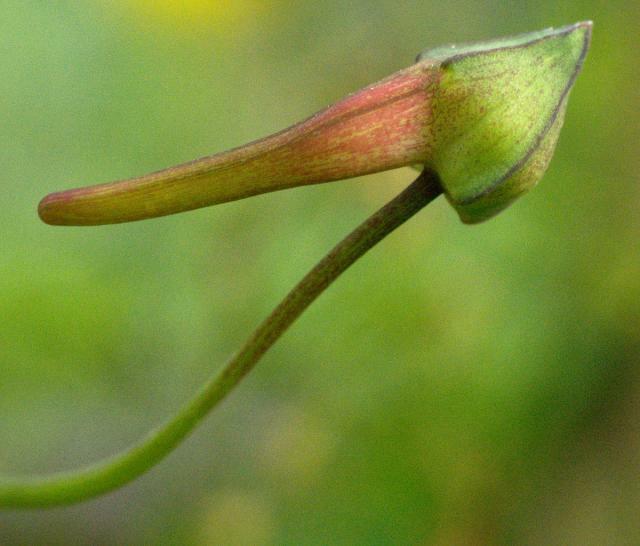 hookerianum, T. hookerianum ssp. 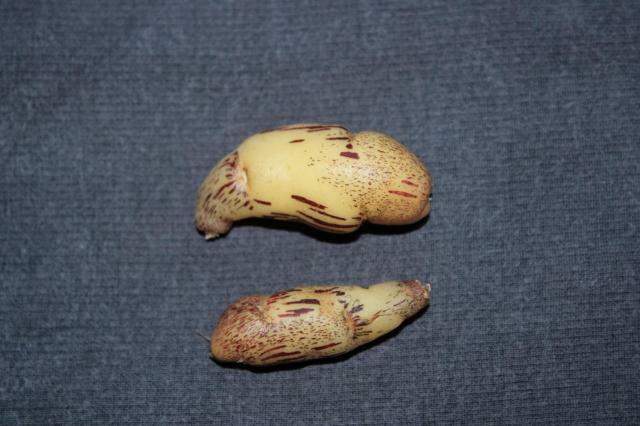 pilosum, and T. hookerianum ssp. 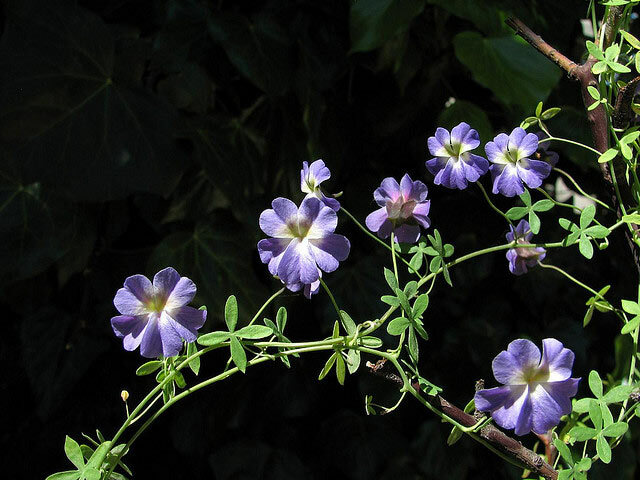 austropurpureum (Diana Chapman). 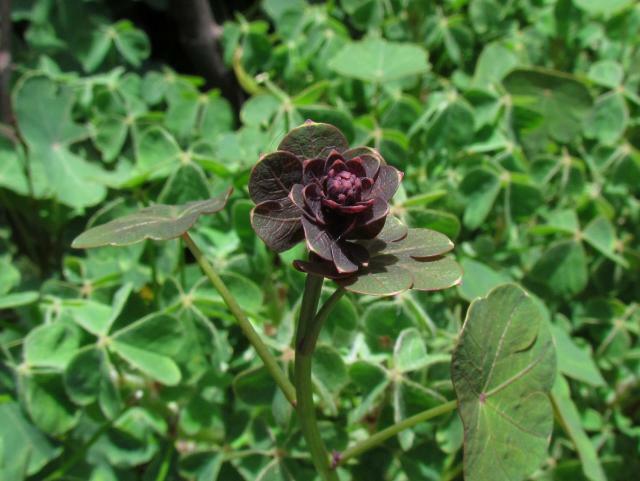 Grow the adult tubers or seedlings in a well drained mix that is neutral to slightly acidic. 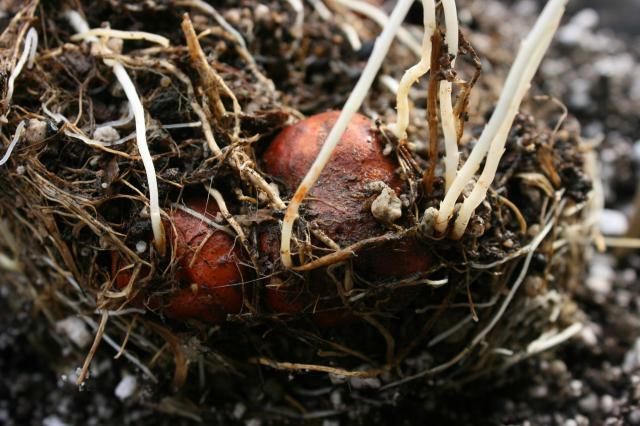 Tuberous species should be planted in a very deep pot at least 6" below the soil. 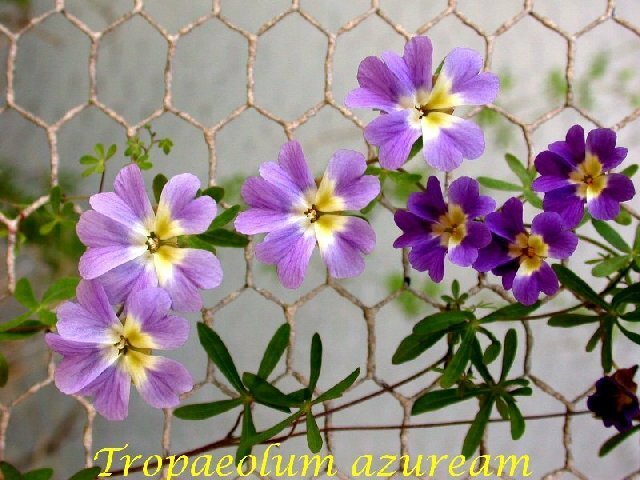 Species such as T. azureum, T. hookerianum, T. brachyceras, and T. tricolor should be grown in part to full sun. 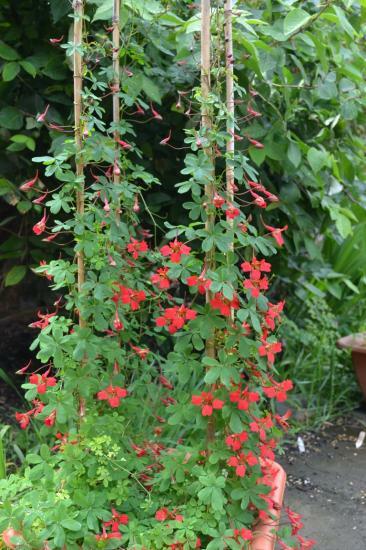 While in growth they need support for the climbing stems such as a trellis or a fence. 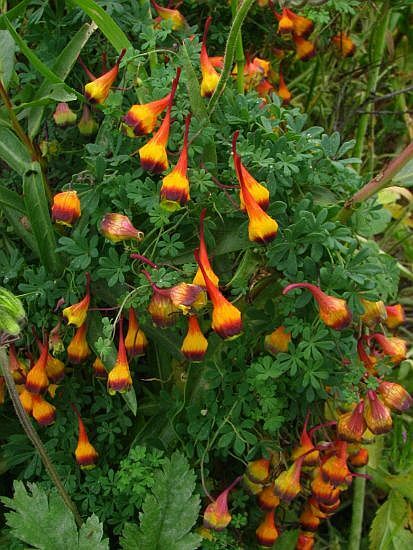 Tropaeolum hookerianum and T. azureum are from coastal habitats and are not hardy. 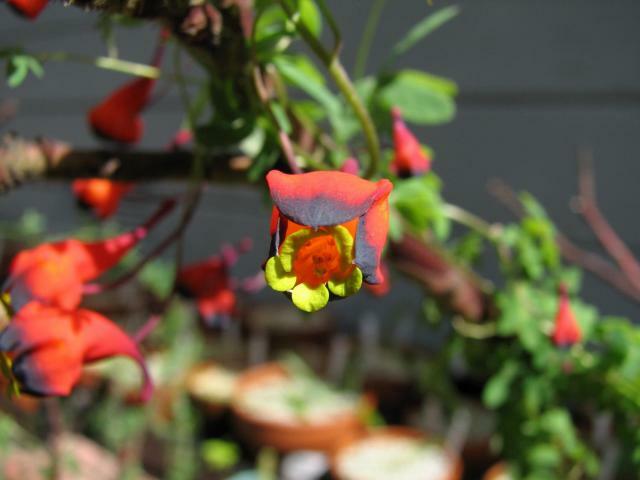 Tropaeolum tricolor and T. brachyceras are more hardy. 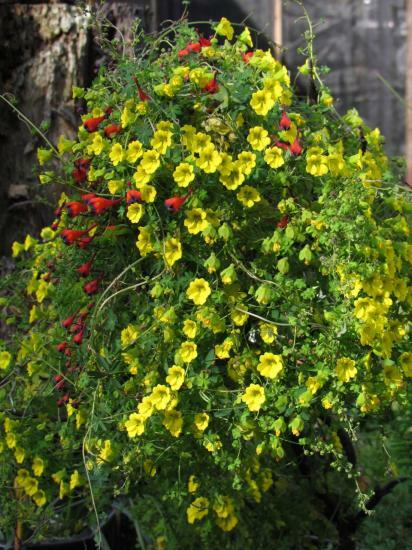 When the leaves start turning yellow, stop watering and give the plants a completely dry summer dormancy. 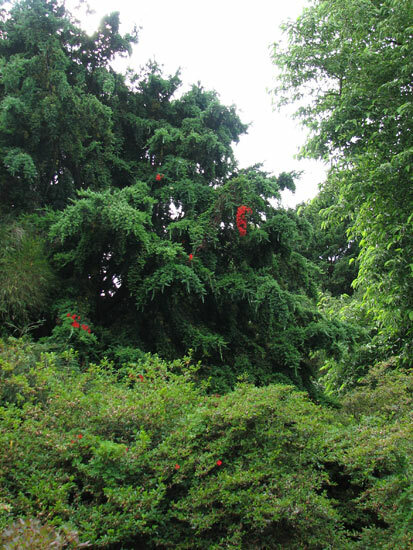 This group is notorious for staying in dormancy and skipping one or two years of growth. 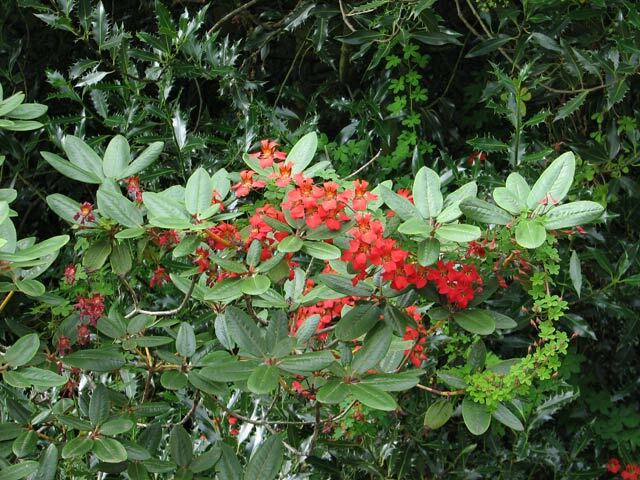 Summer growing species can be grown in the same mix as above but they require good watering during growth. In the winter these plants will go completely dormant. It is not necessary to keep the soil dry during this period. 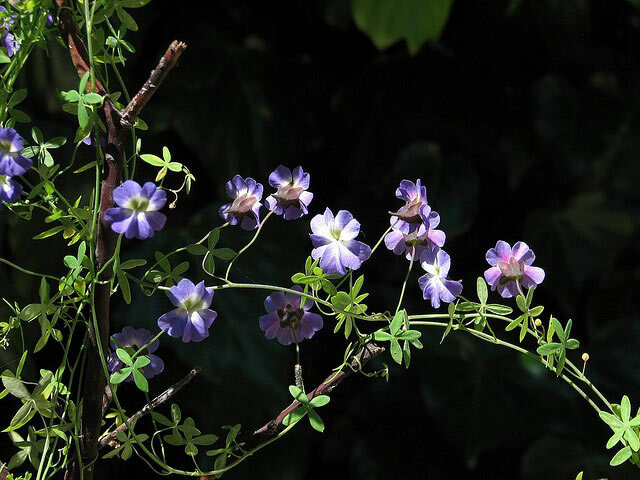 Tropaeolum azureum is a slender tender climbing species from Chile with lavender-violet blue flowers with white eyes that can be as large as 4 cm (1.5 inch). Photos 1-2 below taken by Eugene Zielinski and photo 3 was taken by Jane McGary spring 2011 near Reserva Nacional Pichasca. Photos below were taken by Bill Dijk. 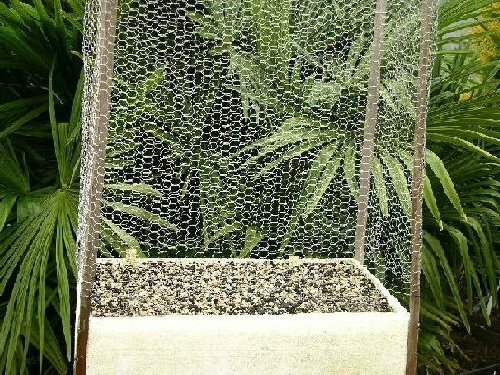 The last photo shows the container with wire netting attached at planting time for support, which will avoid damage to the delicate new shoots later on. 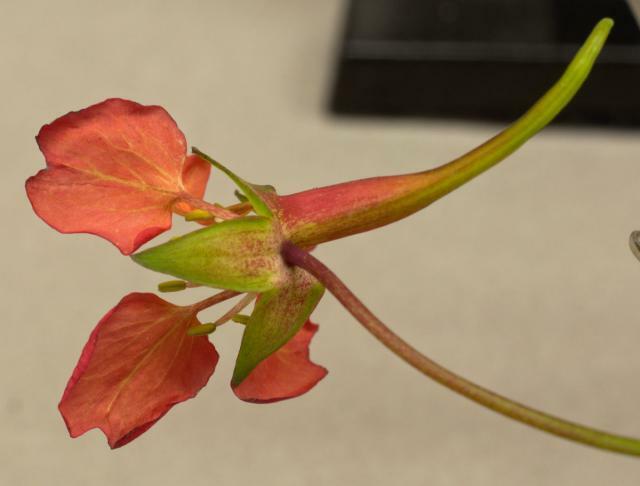 The photos below were taken by Nhu Nguyen of a plant grown in a 1 gallon container. 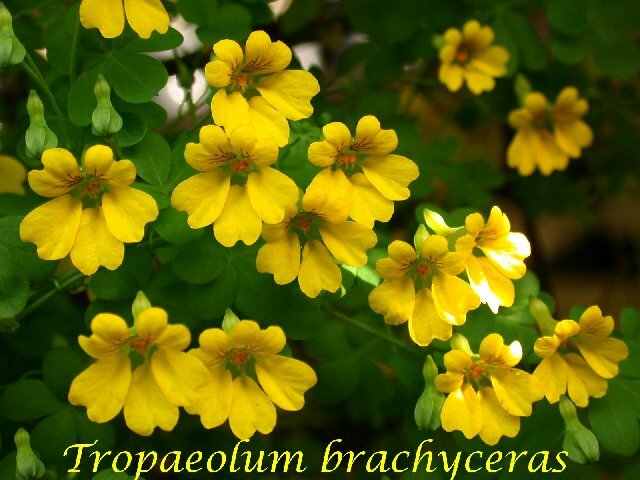 Tropaeolum brachyceras is another half hardy native of Chile, with yellow flowers with purplish markings up to 25 mm (1 inch). 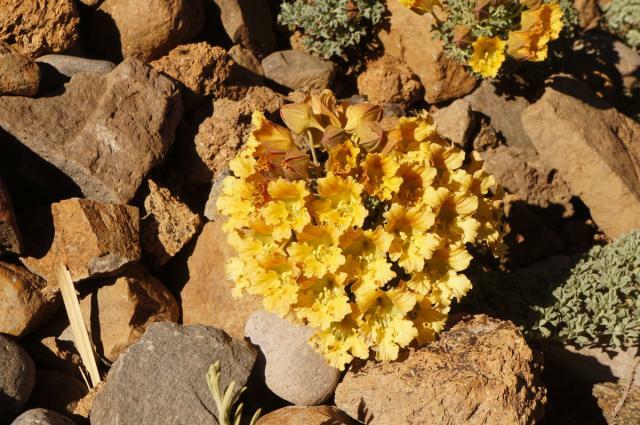 This species may stay dormant some years and it is not clear what triggers it to break dormancy. 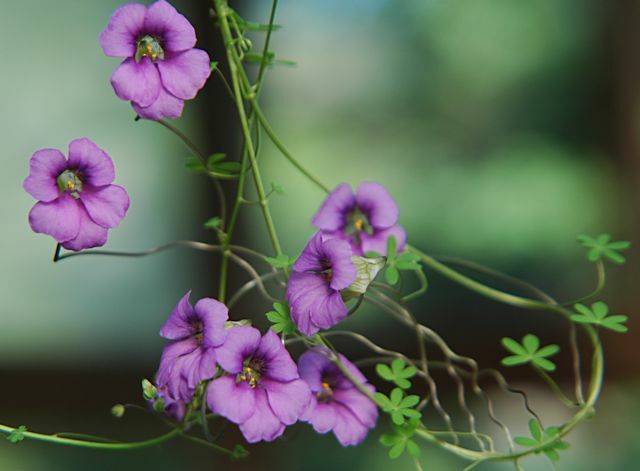 The stems are very tiny and fragile when they first come up and if they are broken or the plant does not get water then, that may be the end of the growth for that season. 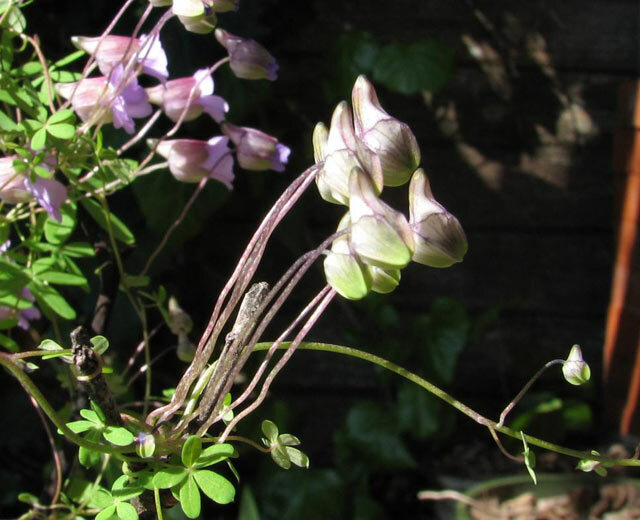 It is a climber and will need support for the thin stems. Photo 1 was taken by Bill Dijk. Photos 2-3 were taken by Mary Sue Ittner, photo 4 was taken by Nhu Nguyen, and photo 5 was taken by Jane McGary. 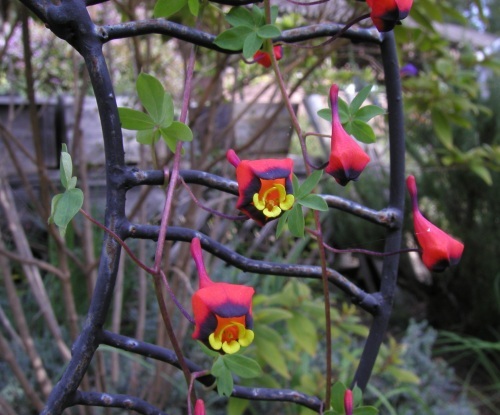 The photo below show T. brachyceras and Tropaeolum tricolor intermingling together. 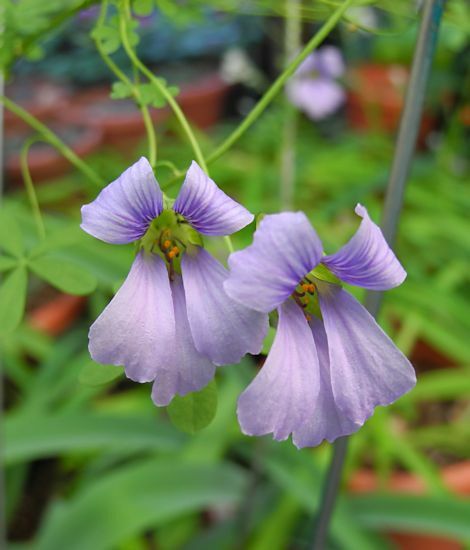 Photo 1 was taken by Mary Sue Ittner are of plants growing in adjacent pot in an unheated greenhouse where both grow on string, reaching to the top of the greenhouse. Photos 2-3 were taken by Nhu Nguyen of plants growing in the same pot (by accident). 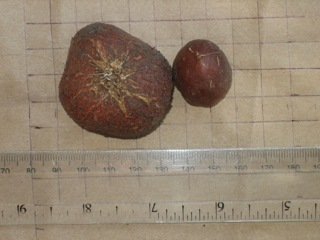 It shows how much more a vigorous grower T. brachyceras is compared to T. tricolor. 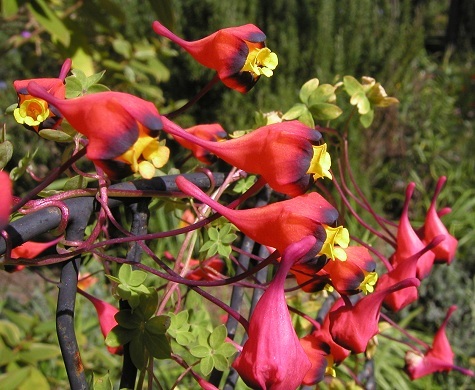 Tropaeolum hookerianum is a tuberous, winter growing species native to Chile. 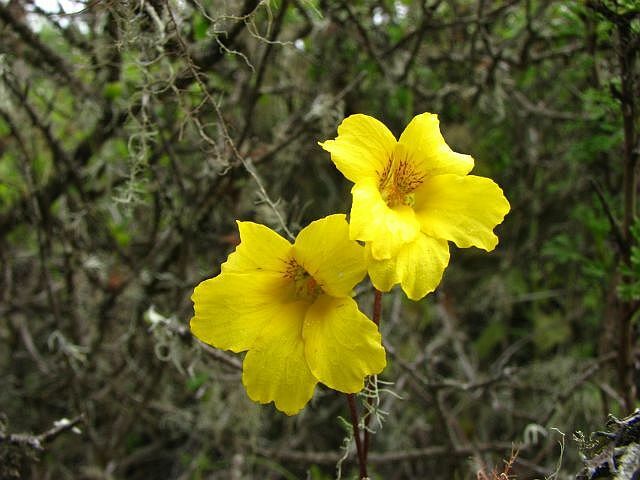 Flores and Watson published the name of two subspecies in 2000. 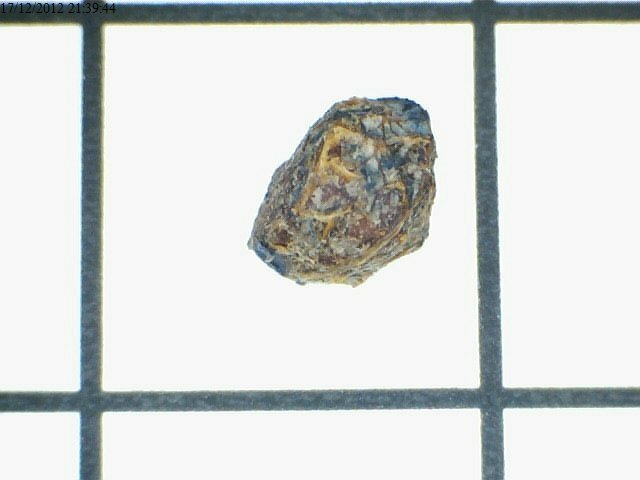 The photo below taken by M. Gastil-Buhl shows the tuber on a 1 cm grid. 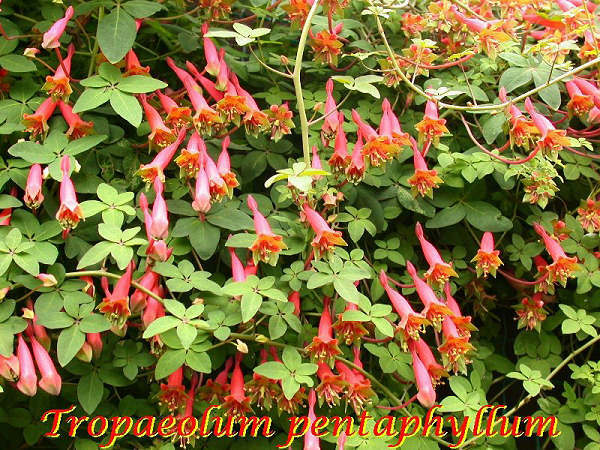 Tropaeolum hookerianum subsp. 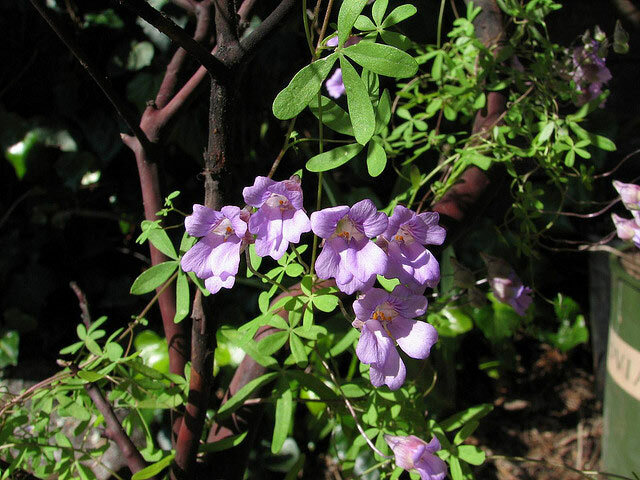 austropurpureum often skips a year or two of growth but when it does grow and bloom, the results are spectacular. 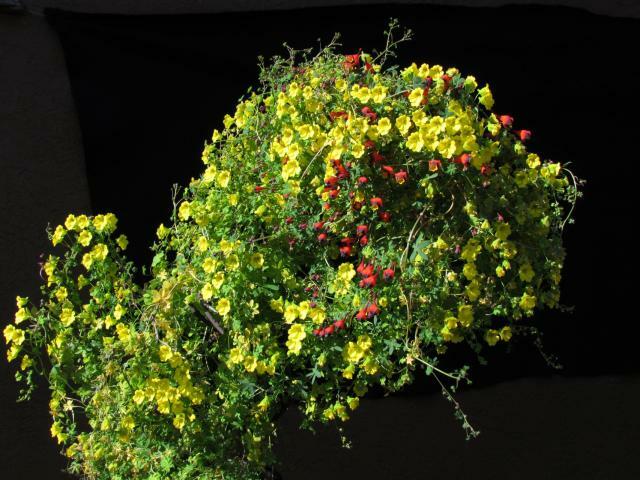 The photos below were taken by Nhu Nguyen of the plant growing in a 1 gallon container. The photos were taken in late March 2009. 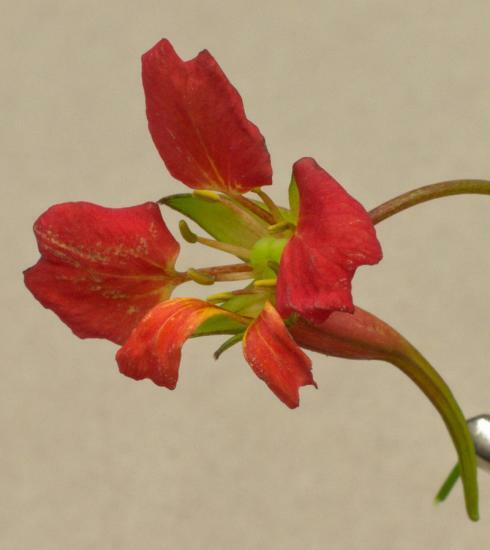 Photos below from Mary Sue Ittner of a tuber purchased from Telos Rare Bulbs show differences in the flowers different years. 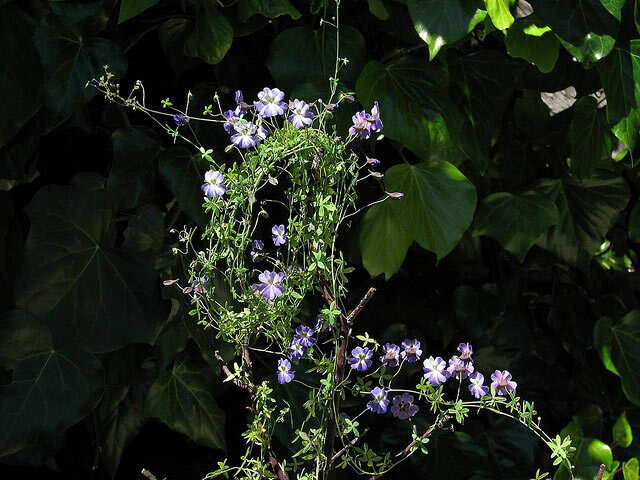 This species has not been nearly as vigorous in growth as the other two species she grows and as pictured in the photos above from Nhu Nguyen and has therefore not needed such an elaborate system of string, wire or trellis. 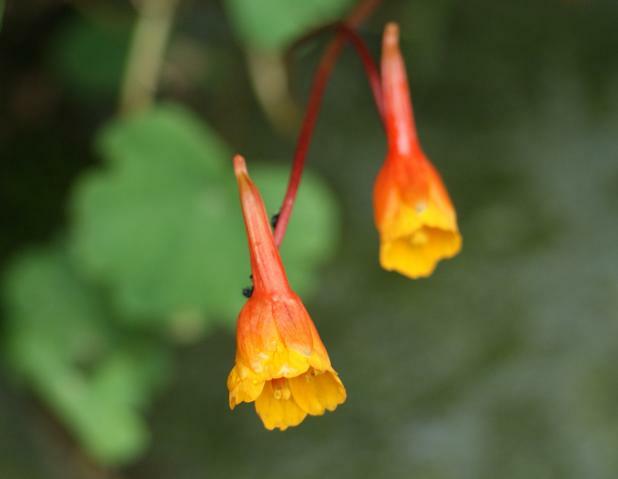 Tropaeolum hookerianum subsp. 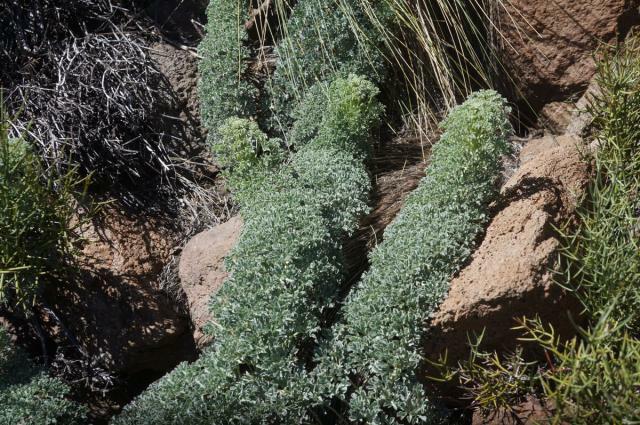 pilosum grows in a small coastal area in arid valley shrub zones. 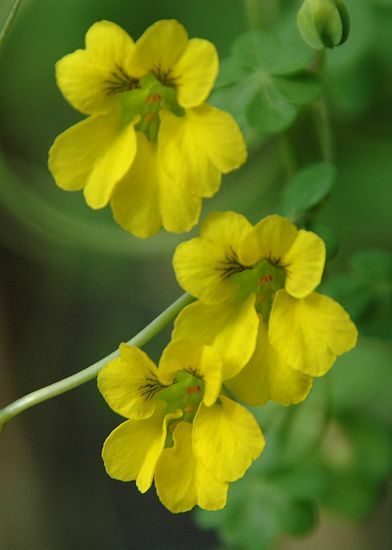 Flowers are yellow with petals longer than the calyx. 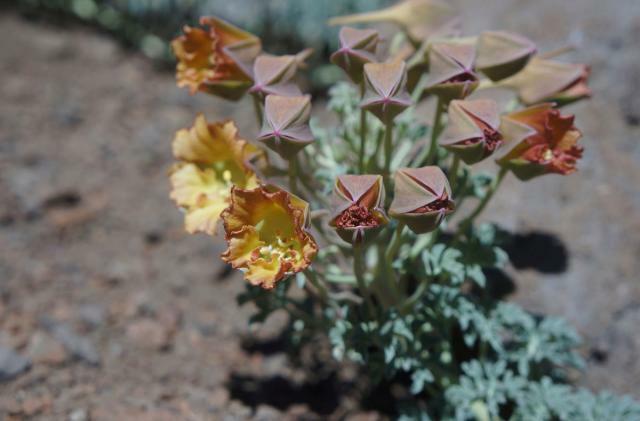 The photo below was taken by Eugene Zielinski spring 2011 of a plant flowering at Parque Nacional Fray Jorge in a very wet year. 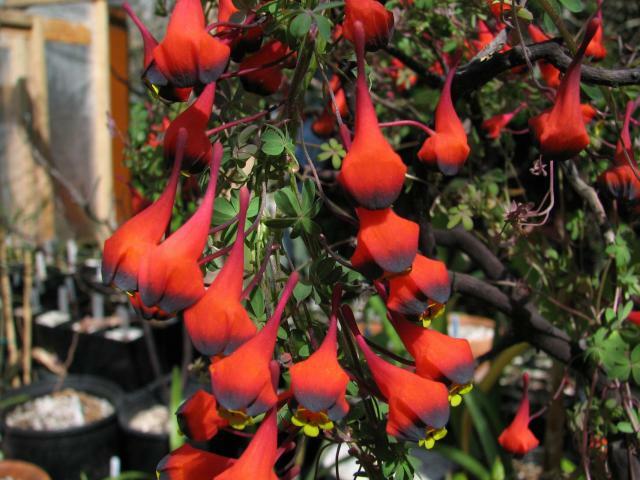 Tropaeolum incisum is native to the dry slopes of the Andes in Argentina. The photo below was taken by Jane McGary. Photographs by Trond Høy taken in Argentina, Neuquen, Caviahue-Cajon Chico road on December 6th 2013. 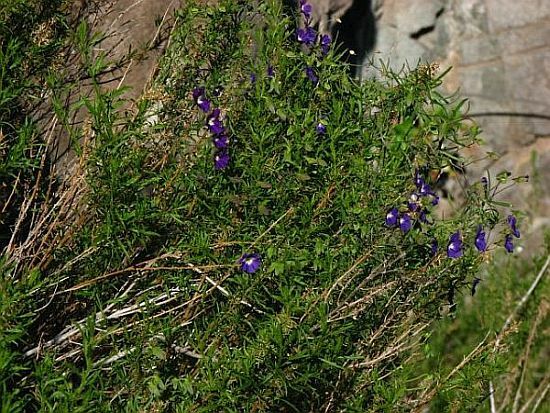 He comments "The plants grew in a scree (volcanic ash and rocks) along the road between Caviahue and Cajon Chico at about 1800 m above sea level. There is snow here during the winter and the soil is moist at least in spring and early summer. 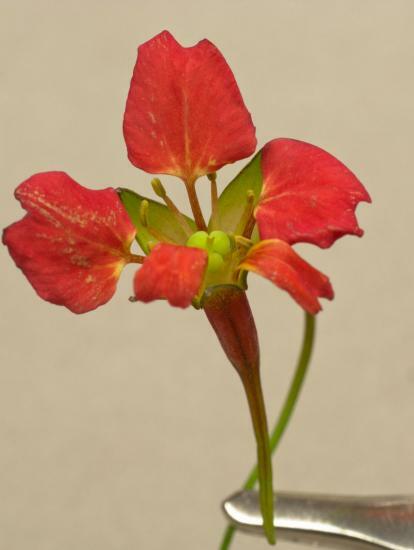 We found probably the same species much higher also but not in flower (a bit too early in the season)." 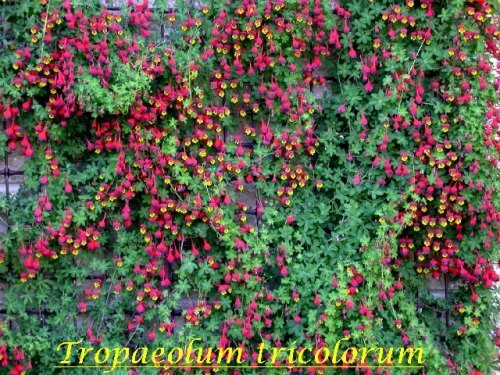 Tropaeolum pentaphyllum Climbing species produces masses of pink flowers, tipped with green, followed by dark purple fruit. 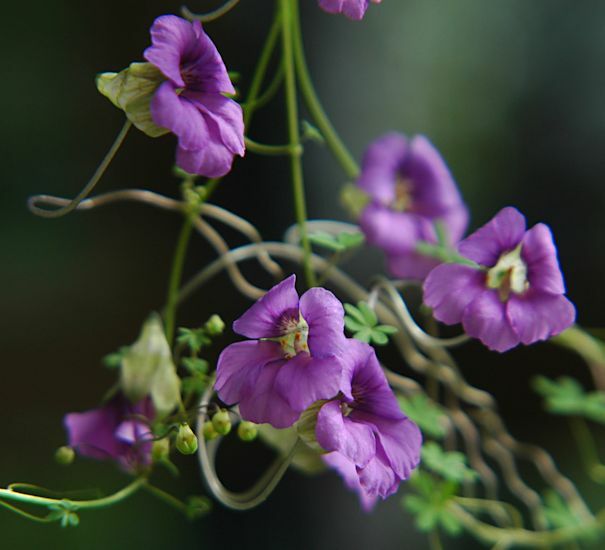 It is commonly called 'Ladies legs', the flowers resembling pink legs with green shoes. 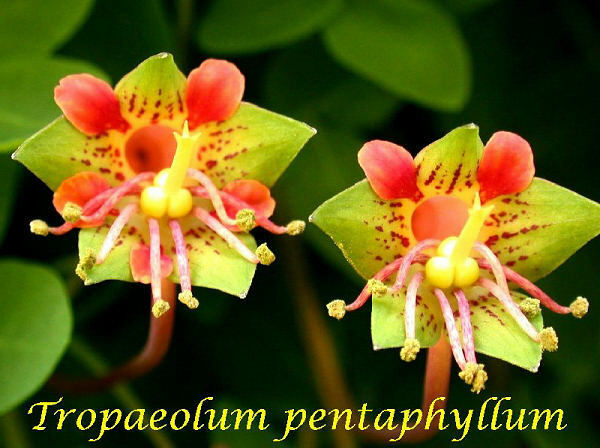 The name pentaphyllum means 'five-leaved'. Photos 1 and 2 by Bill Dijk. Photo 3 of seed by David Pilling. 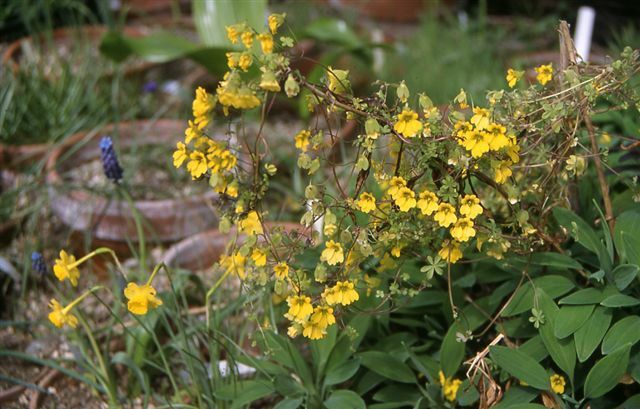 Tropaeolum polyphyllum is one of the tuberous Tropaeolum species. 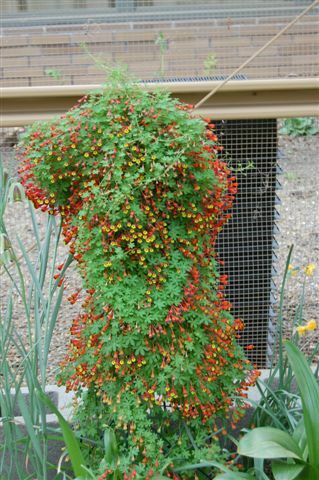 The plant depicted originally came from Gossler's Nursery in Springfield, Oregon ca. 1990. 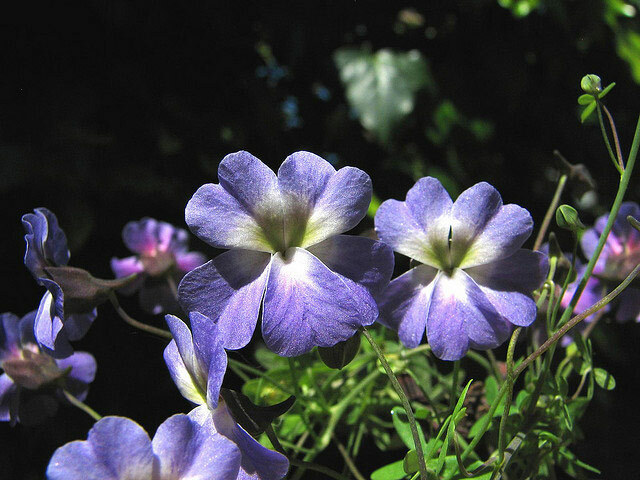 Planted about 3' from a raised concrete patio, it methodically moved year by year until it now emerges from crevices around the margin of the patio. The tubers are probably under the patio at this point. 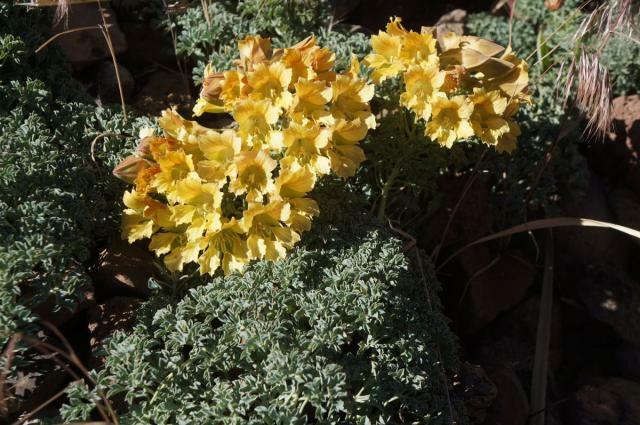 With its gray-blue foliage and clear yellow flowers of some size, this is a very good garden plant. 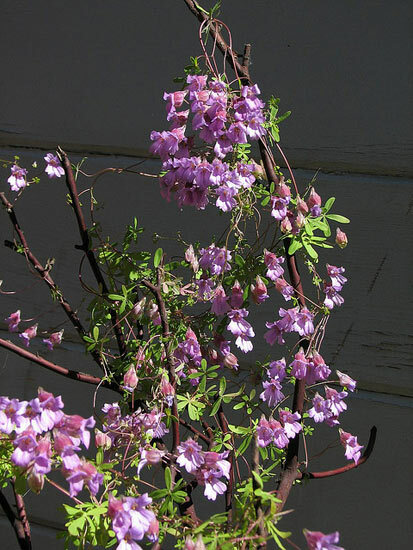 Plant it where the foliage can sprawl and spread; it doesn't seem to be a climber. 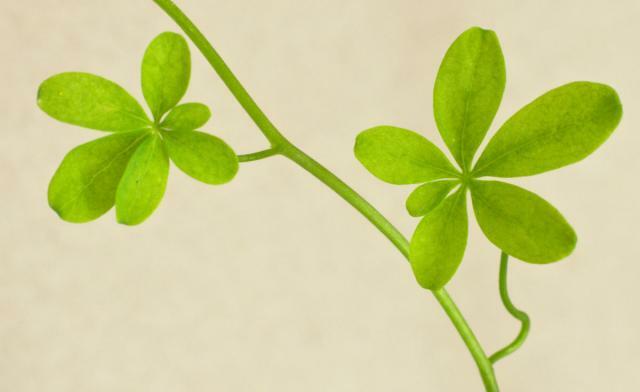 The plant is self-fertile and sets viable seed once in a long while. 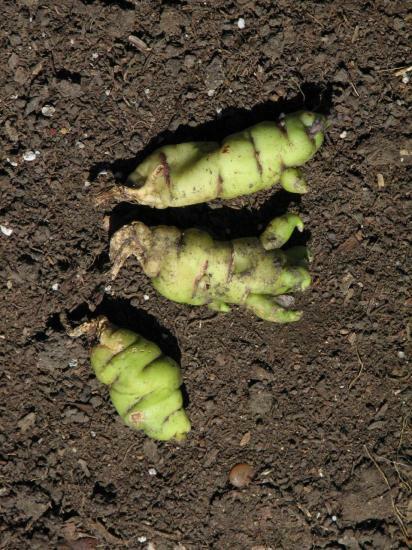 Since this plant puts its tubers a long way below the soil surface, seed may be an easier method of propagation than bringing in a backhoe to lift tubers. 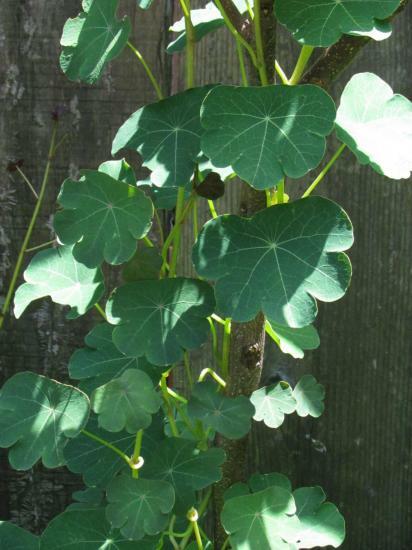 Photo 1 by Rodger Whitlock does not clearly depict the sprawling character of this tuberous nasturtium. 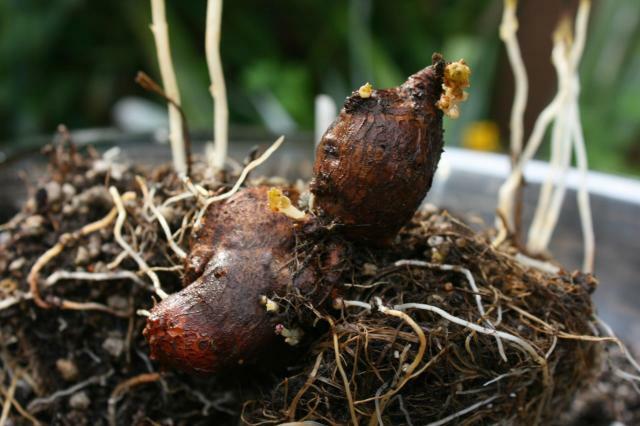 Photos 2-3 by Nhu Nguyen shows the tubers, roots, and new sprouts. 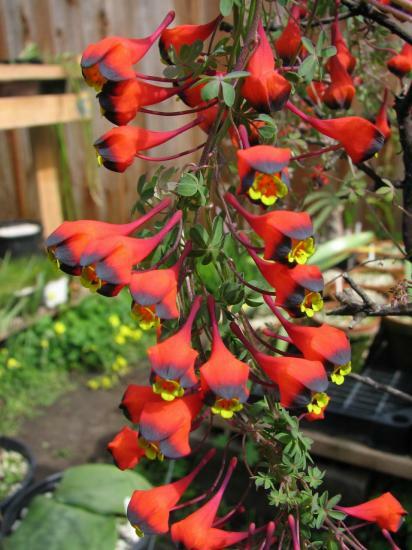 Tropaeolum speciosum is native to central Chile. It is a summer grower and has quite a large stature (see photo below). 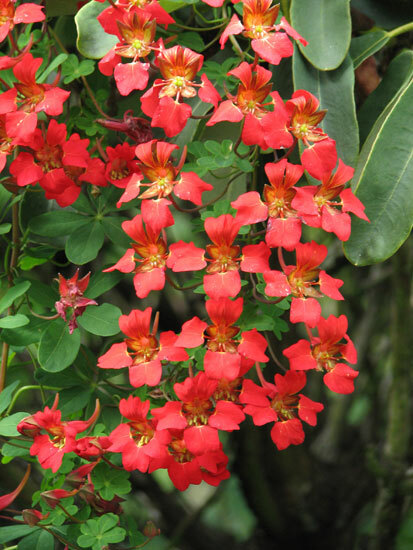 The name "Flame Creeper" is quite appropriate for this species because of the brilliant red inflorescence that can hold dozens of flowers. 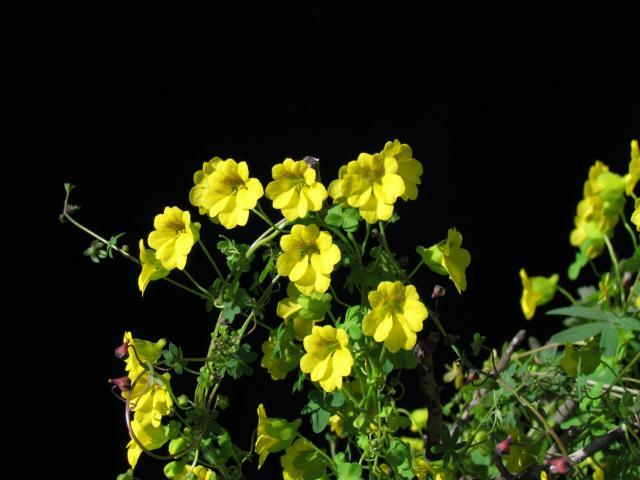 It is difficult to establish but once established, it is very hardy and in Scotland it can be found in abandoned gardens flowering prolifically. Photos 1-5 were taken in August 2010 by Nhu Nguyen at the Royal Botanic Garden at Edinburgh, Scotland. Photo 6 by Caroline Langensiepen. 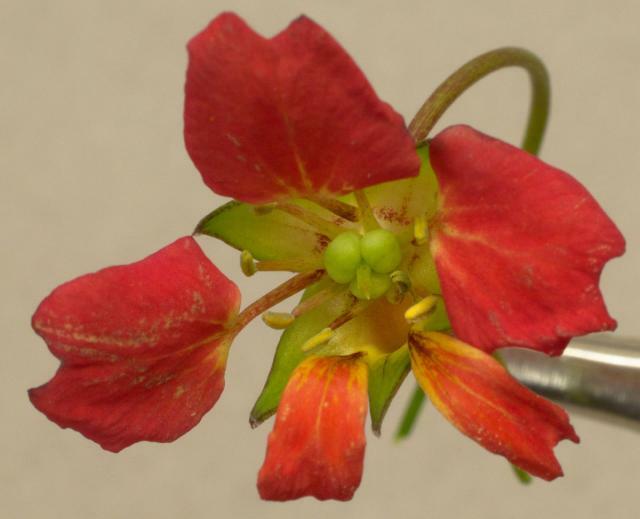 Photographs by David Pilling, the first shows a flower bud. 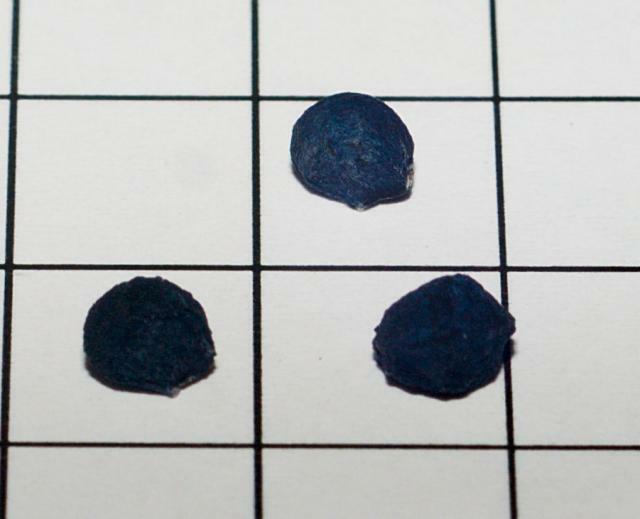 Photographs of seeds on a 10 mm grid by David Pilling, germination occurs at low temperatures (circa 4 °C) and may take several years' temperature cycle. For example dry seed sown in January 2008 and kept outside started to germinate in December 2008, growing leaves in spring 2009. The slightly purple/blue tint is flesh that can be removed after soaking to produce seeds looking like the one in the second picture. 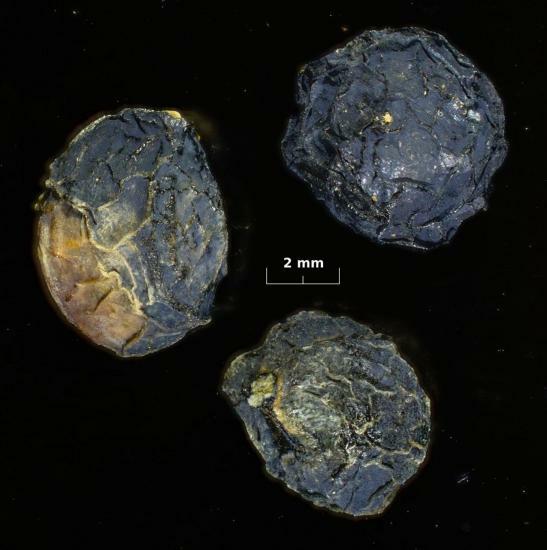 After the first two photographs were taken in December 2012, the seeds were kept moist and exposed to ambient temperatures; photo 3 shows them germinating in February 2014. 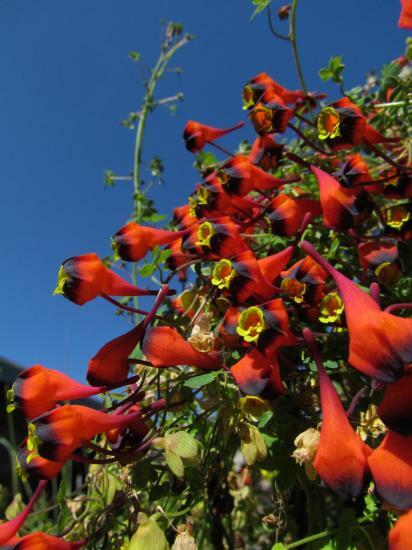 Tropaeolum tricolor from Chile and Bolivia is a half hardy plant with red, violet, blue or yellow flowers with greenish margins. 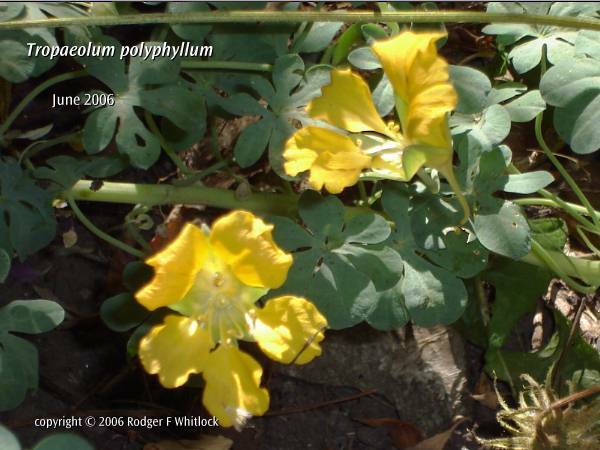 This plant is sometimes referred to as Tropaeolum tricolorum. It is probably the easiest and most reliable of the winter growing tuberous species to grow, returning every year and increasing in numbers. 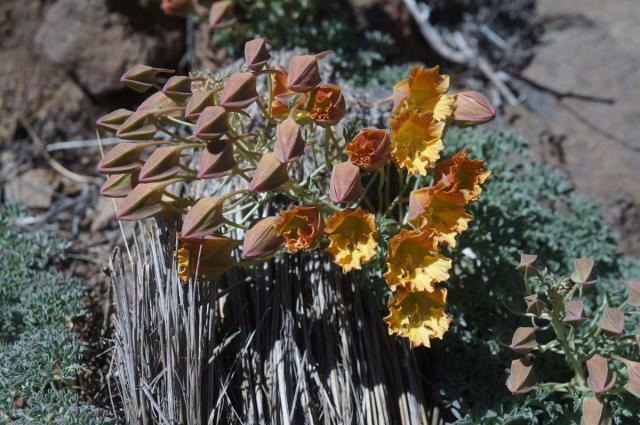 The photo below was taken by Eugene Zielinski in the spring of 2011 in Chile. 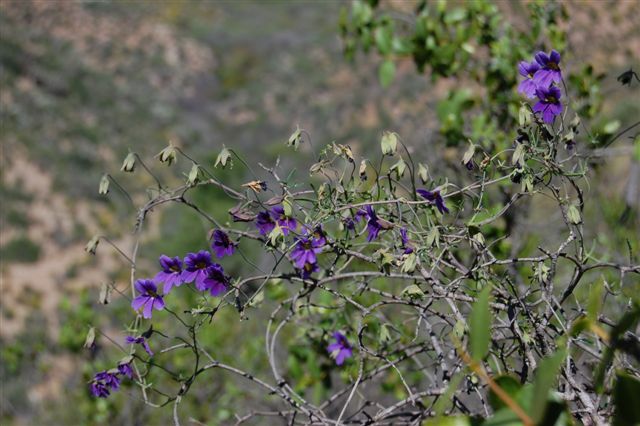 It was growing between Huasco and Carrizalillo. 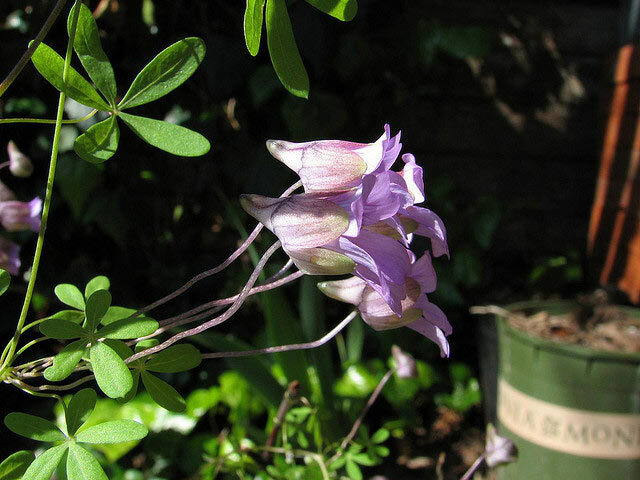 This species is long blooming and a favorite winter blooming plant in Mary Sue Ittner's Northern California garden. 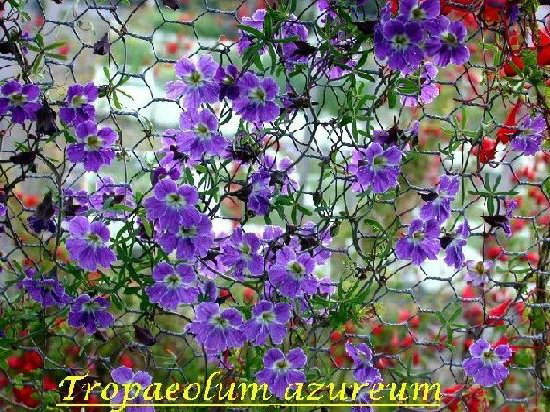 She grows it in a deep container nested in another pot in the ground and provides it with a trellis or fence to grow on. 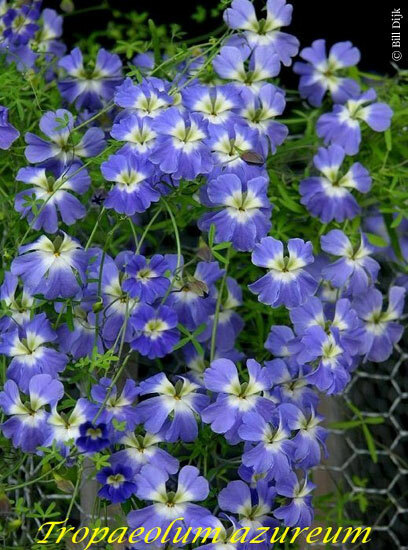 The initial shoots are very fragile so it can be difficult to get them started growing on the trellis so for back up she also has a pot in her greenhouse where she can protect it from the elements. The pot in the greenhouse grows much more vigorously. 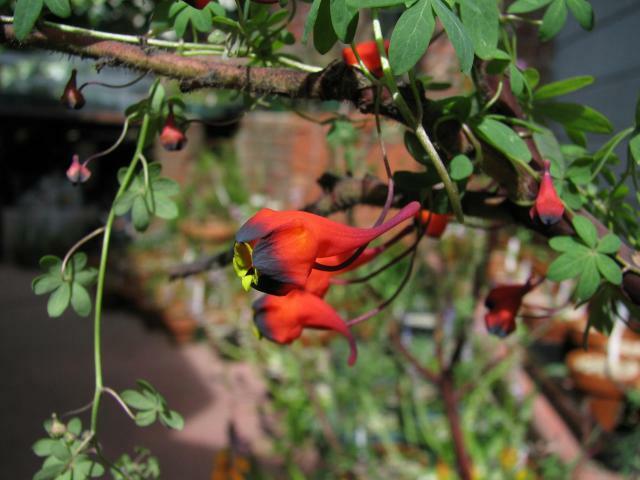 There is a photo shown with species Tropaeolum brachyceras where the two are intertwined in the greenhouse. 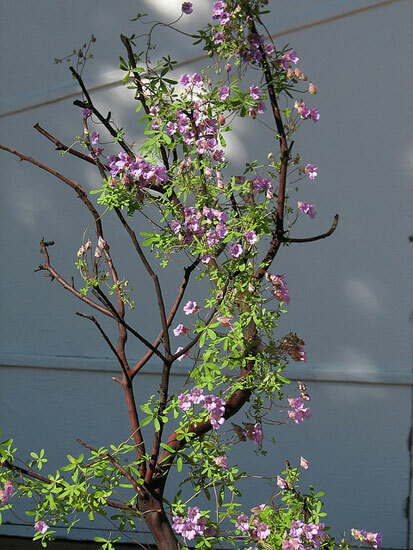 The first two photos by Bob Rutemoeller show the first blooms and then later when there were many more. Photo 3 was taken by Bill Dijk. Photo 4 was taken by Jane McGary of a plant that escaped the bulb house. 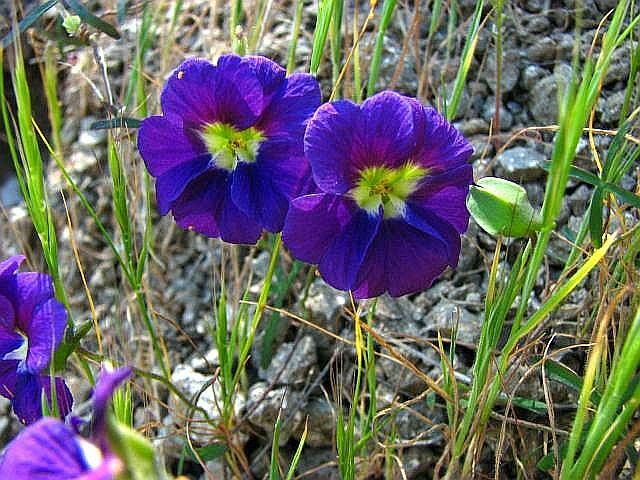 Plants that are able to grow in the ground can be become spectacular specimens. 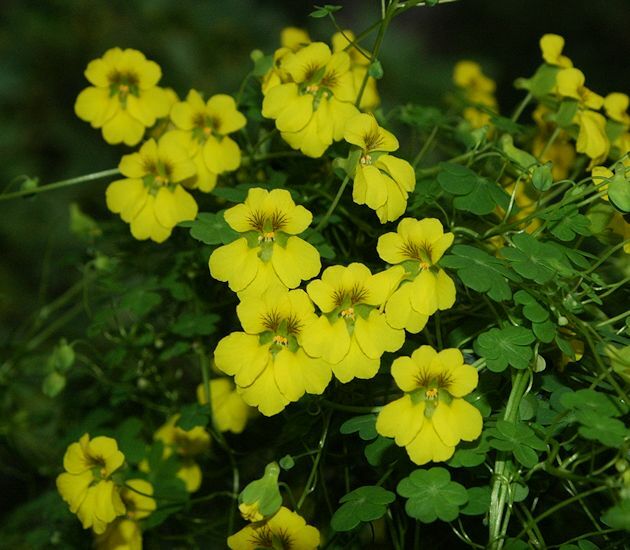 The photos below by Nhu Nguyen show various aspects of the flowers and vegetative habit of this species. Tropaeolum tuberosum see the Tropaeolum tuberosum page.